A rare Sebring Sprite for sale at H&H Classics forthcoming 15 April auction, started out as a works car driven by Pat Moss and Ann Wisdom on the 1960 Tour de Corse before being reborn as a lightweight Sprinzel Sebring Sprite. This very special Austin-Healey Sprite sports car is regarded as the most original of four surviving Williams & Pritchard-bodied Sprinzel Sebring Sprites (from five made). WJB 707 will be sold at H&H Classics’ auction at the Imperial War Museum, Duxford on 15 April 2015. 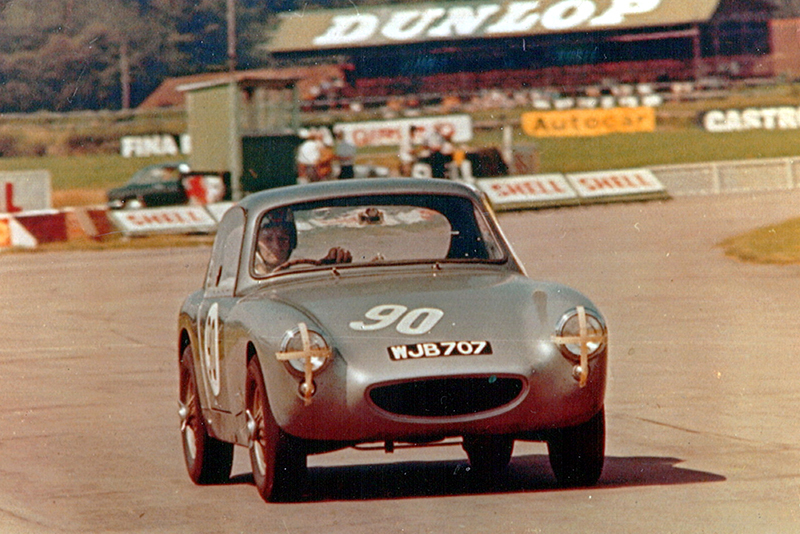 Ian Walker, now best known for running ‘the Lotus B team’ throughout the early 1960s, bought the Austin-Healey works ex-Tour de Corse car direct from the factory. The car was to form part of a three-car team run by John Sprinzel in 1961. Each Sprite was bodied by Williams & Pritchard, as a streamlined, all-alloy ‘Sebring’. Ian Walker wanted to build the lightest, most aerodynamic Sprite of all and carefully specified his car. Steel panels were kept to a minimum and, as glass is heavier than aluminium, the windscreen made was smaller. Under the bonnet sat a one-litre engine courtesy of ace tuner Don Moore and the results were spectacular. Walker dominated the one-litre class that year, the light, slippery and highly tuned Sprite often finished close to much more powerful machinery. As part of John Sprinzel‘s winning Sebring Sprite Team in the 1961 750MC 6 Hour Relay, `WJB 707′ lapped the Silverstone Club circuit faster than the famous ex-Le Mans Austin-Healey 3000 `DD 300’. Walker also set a class lap record at the Crystal Palace circuit in the car that still stands to this day. Perhaps its finest hour was at the Nürburgring 500km in September 1961 where, pitched against the far more exotic Fiat-Abarths, it helped Sprinzel’s Team Sebring win the ADAC Team Prize. The car was sold on for the 1962 season, racing on for a few more years, where it even entered in the last-ever BARC race at Goodwood in July 1966. The current vendor bought it in 1966, entering several hill climbs and rallies before putting it away until 1987 when it was entrusted to marque specialist Brian Wheeler to be used to help with the restoration of sister cars ‘S221’ and ‘410 EAO’. Today, the car comes with an extensive history that includes a letter of provenance from Ian Walker dated 14 February 1967. Most of the aluminium panels date back to 1961, except the bonnet, which has been recreated in glassfibre. Under the bonnet lies a998cc FIA-spec, Entune Garage-built ‘screamer’. 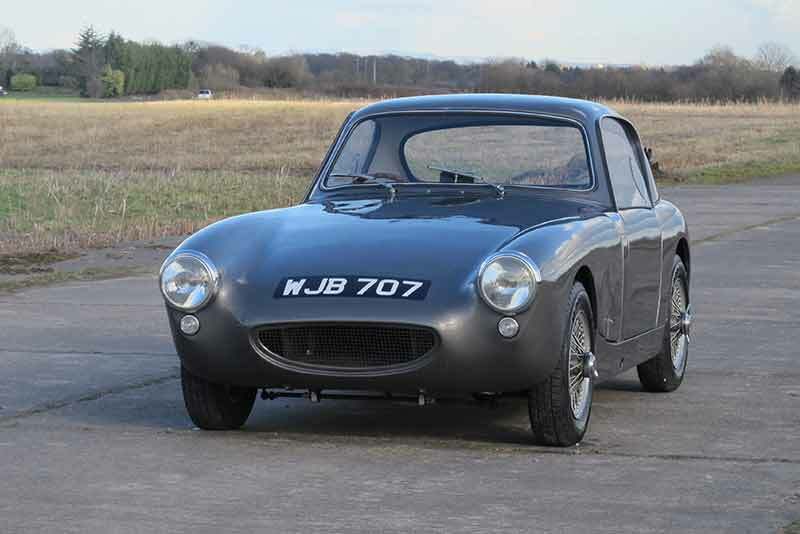 This rare Sebring Sprite for sale at H&H classics, is acknowledged to be the most original of the four surviving Williams & Pritchard-bodied Sprinzel Sebring Sprites. This historically important car is eligible for many blue riband classic car events worldwide and will be joined by many other desirable classic cars, bicycles and motorcycles at the auction, to be held at the Imperial War Museum, Duxford, Cambridgeshire on 15 April. Estimate: £80,000 – 100,000.